We here at Entertainment Maven, in our attempt to bring you informed reviews of theatrical releases, home entertainment and special events, have decided that it’s time to acknowledge one of the largest growing forms of entertainment in the world. Of course what I am talking about is Mixed Martial Arts, and in particular the UFC. Now we will not be getting into live event coverage, there are plenty of avenues which cover the live events as they happen or shortly after, and while we do cover events we have decided they will be film related only at this time. So why are we going to be reviewing UFC DVDs? Because there are only a handful of sites out there doing reviews of the actual DVD releases from UFC. Many fans can’t afford to pay out over $60 a month for pay-per-view events and wait for the DVD releases to see the full card. Also, there are some events you just need to own. These reviews will come in a DVD review format, only slightly different from our other DVD reviews, where we will discuss the main program (card) and list and discuss the special features for the disc. Then we will ultimately give our opinion on whether it’s worth your hard earned money. Now let’s step into the octagon for UFC 145! 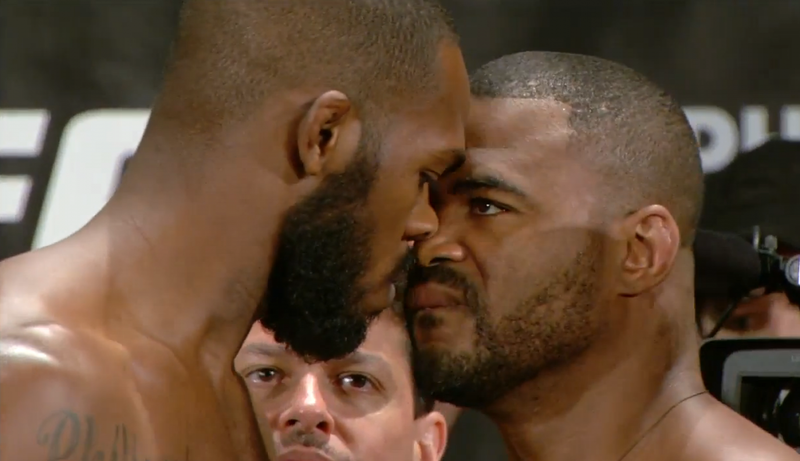 UFC 145 was billed as the end to the bitter and ugly feud between two former training partners and friends, Rashad Evans and Jon Jones. 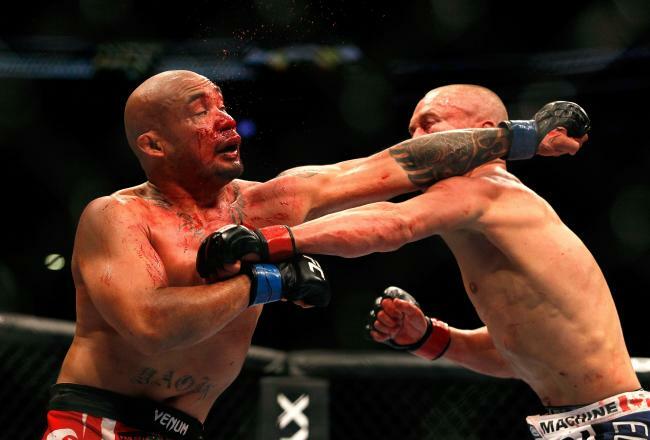 After Evans injured himself leading into his title fight against Maurizio Rua at UFC 128, Jones took his spot and ultimately won the title. During an interview shortly after winning the belt, Jones was asked if he would fight Evans and answered with the statement that he would fight anyone he was asked to. Evans took exception to this and the feud was sparked. The first disc of this 2-disc set features the 6 match pay-per-view card in its entirety. The Main Event Card goes as follows – Evans vs Jones / Rory MacDonald vs Che Mills / Brendan Schaub vs Ben Rothwell / Miguel Angel Torres vs Michael McDonald / Mark Hominick vs Eddie Yagin and Mark Bocek vs John Alessio. The Main Card this time around delivers in spades. The main event is a good fight but results in a pretty lopsided affair by the end of it. Rory MacDonald makes Mills look like an amateur here with another impressive annihilation of an opponent. Quick surprise knockouts are the result of our two middle fights, and our first two of the pay-per-view card, Yagin vs Hominick and Bocek vs Alessio both go the distance with one result being a little controversial. That said the Yagin vs Hominik is a bloody, messy, straight up brawl that really is an excellent bout. Also, Michael MacDonald delivers an impressive, attention worthy performance. The 2nd disc has all the preliminary fights and special features. Prelim line up is as follows – Travis Brown vs Chad Griggs / Matt Brown vs Stephen Thompson / John Makdessi vs Anthony Njokuani / Mac Danzig vs Efrain Escudero / Kieth Wisniewski vs Chris Clements / and Marcus Brimage vs Maximo Blanco. This time around it was the prelims that had the judges working overtime as out of the six bouts only one resulted in a stoppage. The Brimage vs Blanco fight’s most entertaining moment was not in the dull fight but the after bout celebrations which spontaneously turned into a back flipping contest. The stoppage comes in the Brown vs Griggs fight and it was the winner for submission of the night. For special features we get a fantastic Countdown to UFC programme. The interviews and behind the scenes stuff is superb, especially the face to face interview at CSS sports studios where Jones and Evans verbally spar in numerous heated exchanges over who said what heading into the fight. I also loved the part where Jones calls out Evans on his accusations of Jones’ arrogance by referencing the most arrogant stuff Evans has done, and there are a lot of clips to pull from. We also get a behind the scenes short film and the complete broadcast of the official weigh-ins as usual. What are missing unfortunately are the 3 UFC primetime episodes they shot for this fight. Clocking in at about an hour minus commercials, this fantastic series would have made this disc complete. 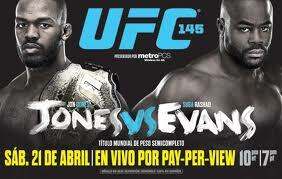 UFC 145 delivers the goods on the main card and the main event does not disappoint. I recommend this as a purchase based on the Rory MacDonald performance alone, but the Jones/Evans bout and other solid performances, like the one from by Michael McDonald, also make it an easy sell. UFC 145 is a solid buy for any UFC fan. Make sure to keep up with what’s going on at Entertainment Maven by liking our Facebook page and having updates delivered right to your Facebook News Feed. It’s the only way to stay on top of all of our articles with the newest blockbusters and all the upcoming films and festivals in Toronto, along with continuing reviews of the latest releases from the UFC.